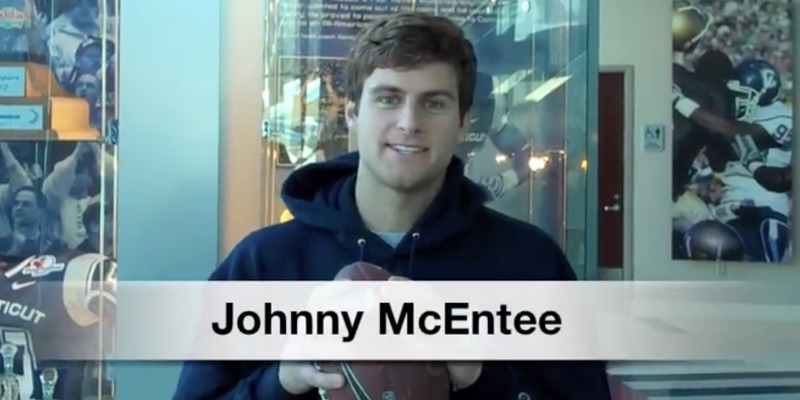 HardcoreHuskies / YouTubeBefore he was fired from the White House staff, Johnny McEntee was famous for firing footballs at UConn. John McEntee, a former personal aide to President Donald Trump, was fired from the White House on Tuesday. Before McEntee was working for Trump, he was a viral star, known for a trick-shot compilation video he released while he was quarterback for the UConn Huskies in 2011. McEntee is just the latest in a long line of Trump staffers who have left the White House in recent days. John McEntee was fired from his job as President Donald Trump’s “body man” on Monday, as he is reportedly under investigation by the Department of Homeland Security for “serious financial crimes,” according to CNN. McEntee was one of Trump’s longest-tenured staffers, having joined during the campaign. He looks to have already landed on his feet – just minutes after news of his departure broke, it was announced that McEntee would be joining Trump’s reelection team as a senior adviser. But years ago, McEntee had another, decidedly different 15 minutes in the spotlight. In college, McEntee played quarterback for the UConn Huskies. While he was by no means a superstar on the field – McEntee led the Huskies to a 5-7 record with 12 touchdowns and eight interceptions in 2011 – he did find viral fame thanks to a trick shot compilation video posted to YouTube. In what now serves as a sort of time capsule of 2011, McEntee spent the video spanning the UConn campus, hitting various trick shots while M.I.A.’s “Paper Planes” and MGMT’s “Kids” blared in the background. As of Tuesday, the video had over 7 million views. You can watch the compilation of trick shots below. McEntee is just the latest in a long line of Trump staffers to leave the White House in rather sudden circumstances.